Suspenseful episode last night -- I know it had me yelling out at the TV a couple times! Daryl showed us why it's not a good idea to scout around on your own after the zombie apocalypse; if there's an accident, you're on your own. 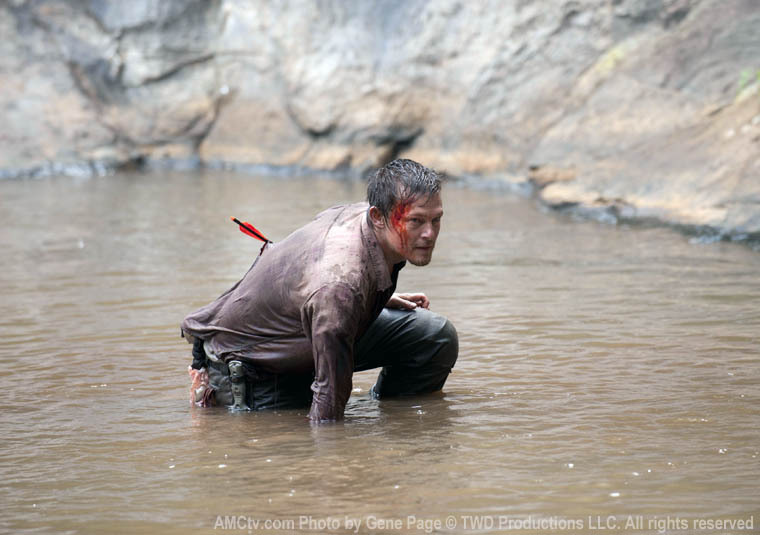 Of course, Daryl is tough enough and crazy enough to drag himself out of almost anything, but he definitely had a few close calls--2x horrible falls, arrow through the side, zombies nibbling on his boot and getting shot in the head. When Andrea was sighting in on him, I thought for sure that he was done for. I was pretty ticked off, actually--Daryl is my favorite character on the show. Relieved that he pulled through. We also found out why Hershel wants everyone to move on quickly--he's got a barn full of zombies! Hershel explained his belief that a cure for zombie-ism would eventually come, which is why he's opposed to shooting zombies and has the barn full of the critters. Hershel's family/friends are probably all in the barn, and he thinks (foolishly, of course) that eventually someone will show up with some magic medicine and make them all better. Obvious point of conflict here, and I'll bet ya those zombies don't stay locked up in the barn forever. During the beginning flashback, anyone note that the abusive husband slob was either a survivalist or ex-military? Had a bunch of MREs and went off on his wife for violating operational security/opsec? I'm glad that the show does paint other survivalist-types in such bad light. Anyways, tip for the apocalypse--if someone has just violated your opsec, it's best not to reprimand them for it in front of the same audience you didn't want finding out about your food stash in the first place. Another note about the friendly fire incident--first, Andrea failed to properly ID her target, though admittedly Daryl looked like a zombie even a few paces away. If your group is in a situation like that--defending a position with a long standoff space or field between you--you need to devise some kind of signal or identifier for friendlies. Uniforms, specific articles of clothing, flags, colors, hand signals, that kind of thing--something that would be visible over a several hundred yard distance. Heck, some kind of identifier is essential whenever there's multiple groups of armed people operating in the same area--it is far too easy to not properly identify someone and end up with a friendly fire incident. Anyways, enough from me--what did you guys think about last night's episode? Reactions? Anything else you noticed?